Pierre-Emerick Aubameyang is one known for extravagance especially when it comes to automobiles and he seems not to regret such a lifestyle. The Arsenal striker while speaking of his prized possession of cars said he does not care what anyone says or thinks about how he chooses to spend his money. The 30-year-old is a proud owner of a Ferrari, Range Rover Sport Mansor, Porsche Panamera Turbo Techart and an Aston Martin D89 Volante 2. 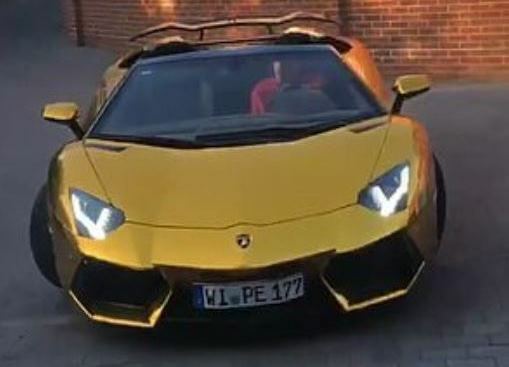 He also has a golden Lamborghini Aventador which he showed off on Instagram recently. In an interview with the Mirror, Aubameyang disclosed how he enjoys living life to the fullest not caring how people react towards his choice. "The clothes, the cars and all that are a bonus", the highest goal scorer for the Gunners so far this season said. "I enjoy living this way. "I like who I am and it doesn’t matter if other people can’t ­accept that – it goes over my head. "As they say ‘you only live once’. It’s important to know where you come from and where your roots are – the rest is a big bonus." Aubameyang is fourth on the Premier League's top scorers list with 15 goals. He is tied with Tottenham's Harry Kane and trail Liverpool's Mohamed Salah and Manchester City's Sergio Aguero with two goals. The Gabonese international will have to do more if he is to return to top spot where he had a lengthy stay before losing spark of late. Wednesday's game with Bournemouth is another opportunity to add to his tally and mount pressure on his competitors.